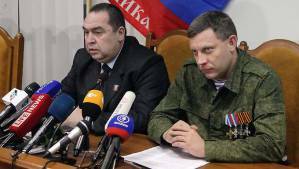 Distasteful anti-Semitism demonstrated by Kremlin-backed militant leaders Alexander Zakharchenko and Igor Plotnitsky in Donbas on Monday received wide but typically inadequate coverage. The attack made by the leaders of the self-proclaimed ‘Donetsk and Luhansk people’s republics’ on the ‘miserable’ Jews running Ukraine was not proof that “anti-Semitic sentiment remains widespread in Ukraine”. It was anything but. The militants, both those relatively few Ukrainian-born individuals installed after Kremlin-installed Russian nationals like Igor Girkin and Alexander Borodai were withdrawn, their predecessors and a large contingent of far-right Russian nationalists fighting in Donbas, have demonstrated similar anti-Semitic views on previous occasions. This has been seen most often with respect to Ukrainian oligarch and active member of the Dnipropetrovsk Jewish community, Ihor Kolomoisky, but also to members of Ukraine’s government. This gels very badly with the standard line taken by the Kremlin about a supposed ‘anti-Semitic and fascist junta’ that seized control in Ukraine. The incongruity was picked up immediately by the Euro-Asian Jewish Congress which reported the anti-Semitic utterances made by “Moscow puppets speaking on behalf of territory occupied by Russians and collaborators from the local population”. The report ends with a reminder that “in the Spring of last year the Russian foreign ministry officially called the actions of pro-Russian separatists in Donbas supported by Russian diversionary formations “protests in response to violence against all who don’t agree with the anti-Semitic actions of the coalition which has taken power in Kyiv”. Attempts by the Kremlin under President Vladimir Putin to use an ‘anti-Semitism card’ in Ukraine have been systematically demolished, most often by Jewish public figures and organizations (exampleshere). They have not been helped by demonstrations of anti-Semitism by pro-Russian militants and the credentials of some of the neo-Nazi or fascist organizations in Russia most actively supporting the militants. In an interview given last week on International Holocaust Remembrance Day, Viacheslav Likhachev, long-time monitor of anti-Semitism and xenophobia in Ukraine was asked whether a reassessment was underway among nationalists of anti-Semitism and the Holocaust. He replied that in the Ukrainian nationalist milieu there is a clearly observable trend towards a positive attitude to Jewish people and a rejection of anti-Semitism. This, he said, was in contrast to Russian right-wing radicals, especially those involved in the conflict (in eastern Ukraine) where the anti-Semitic sentiments are getting stronger. “The two tendencies are linked both to the specific features of the Ukrainian situation, and to mythology. As a textbook example of Ukrainian-Jewish solidarity from real life we can mention the case of Ihor Kolomoisky who has become a symbol of the battle for Ukrainian sovereignty. Then there’s the wish by Russian nationalists to call Ukraine’s President Waltsman. This helps them explain why they’re fighting their brother nation – “they’re liberating them from the Jews in power”. While not seeing any great danger of a real upsurge in far-right parties in Russia, Likhachev points out that those in power in Russia are making use of radical nationalist ideas and adapting them so that they appeal to the public – “from the fight against so-called ‘illegal migration’ and ‘national traitors’ to ‘protection’ of compatriots throughout the world”. He warns that those extremists are quite capable of using the experience they’ve gained at ‘street level’. Their participation in the aggression against Ukraine, he adds, is helping to mobilize and organize Russian radical nationalists. While some will doubtless not return alive, others will come home with all psychological restraints removed and with experience of violence. Both EuroMaidan and Russia’s undeclared war brought Ukrainians a number of very hard lessons. Nobody is suggesting that anti-Semitism has disappeared, or will, but one positive development has undoubtedly been greater awareness of what Ukrainians, regardless of ethnic background, share. The situation in Donbas in contrast is surreal with far-right, often neo-Nazi nationalists, both home-grown like Pavel Gubarev or Russians like Alexei Milchakov using the vocabulary foisted on them by Kremlin propaganda. Hardly surprising when neo-Nazis or others from the far right are supposed to be fighting Putin’s “anti-Semitic Kyiv junta”, on occasion, like Monday’s press conference they forget their lines. • Entire Pskov paratrooper regiment killed in Ukraine?